A few weeks ago I wrote a lengthy Facebook post (see image below) that contained my own personal aha and awareness for the life event that I was facing – competing in eWomen Network’s North America’s Next Greatest Speaker Contest in Dallas, Texas. I had been selected as a Top Ten Finalist (thank you for voting for me!!!) amongst over 1,000 applications. Talk about humbled. And talk about the internal pressure that I felt at times to “perform”. I was definitely putting myself out there and even asking others to “judge” me and my heart so the emotions at times were ripe for the learning. So in my preparing for this experience, early one morning I had this awareness that took my power back from the fear, the perfectionism, the outcome…I can only control how I SHOW UP – and how I choose to experience this or any experience. In life at times, you will face heartache, struggle, and challenge. Some times people will lie about you or betray you. Or politics may win out. They may say “no” to your offer, services, or product. Your book might be rejected 144 times before you get a yes. You may not make the honor roll, get the lead in the play, or get into the school of your choice the first time around. Or second. Or third. You may be passed up for the promotion. You may not hit the rank you want when you want. __________ insert your own here. You can only control how you SHOW UP. 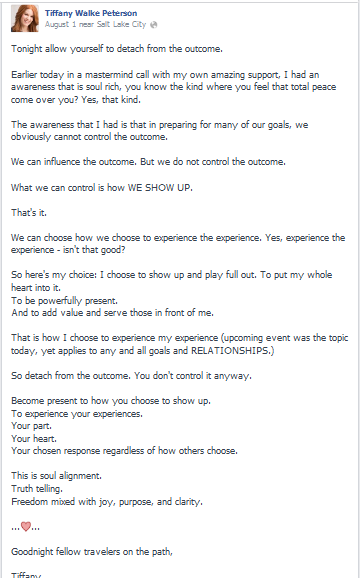 How do you choose to SHOW UP regardless of the outcome? For me, there is great peace in focusing on the only thing I can always control, influence, or direct in my life: how I show up. And like I said in my post, I choose to show up and play full out. To give my best and the best service I can, whether they say yes or no. So that’s the thought to ponder this week…in your life and in your experiences, how will you choose to show up? There are many things, people, and outcomes we cannot control. We can influence yes, control, no. By muddling with trying to control the outcome, we create our own misery. 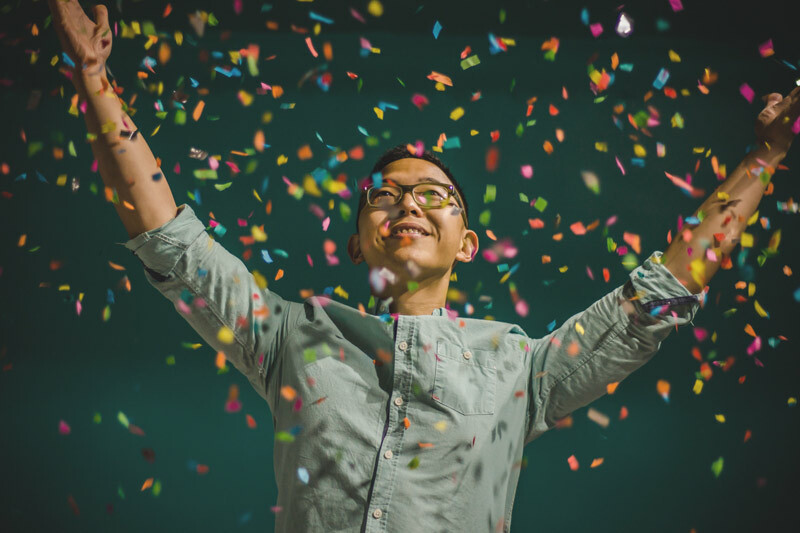 Our power, attention, and energy I find is best suited to be focused where the choice is 100% ours – with ourselves and how we choose to play the game of life being served right now. And focus on showing up powerfully present, fully engaged, and loving no matter what. That’s a life worth living… regardless of the outcome.